Back in April 2009, Survey Monkey announced that is has been acquired by an investor group led by Spectrum Equity Investors and including Bain Capital Ventures. Shortly after we kind of expected a move from SurveyMonkey that at the time only offered entry level survey services to its customers. Time went by and nothing seemed to happen to Survey Monkey. They added multi language support for their website, now being available in 12 languages, but that was it. Well, things changed lately. Survey Monkey is now stating it’s offensive against the online surveys market. First, they bought Precision Polling back in 2010, a company that allows quick and easy phone polls. Recently, they acquired a stake in Clicktools, a powerful, flexible ‘On Demand’ environment for creating surveys, scripts and forms, collecting that information and combining it with an existing CRM. A couple of weeks ago, an important move was done by their main site www.surveymonkey.com that now has a lot of brand new features and payment plans. 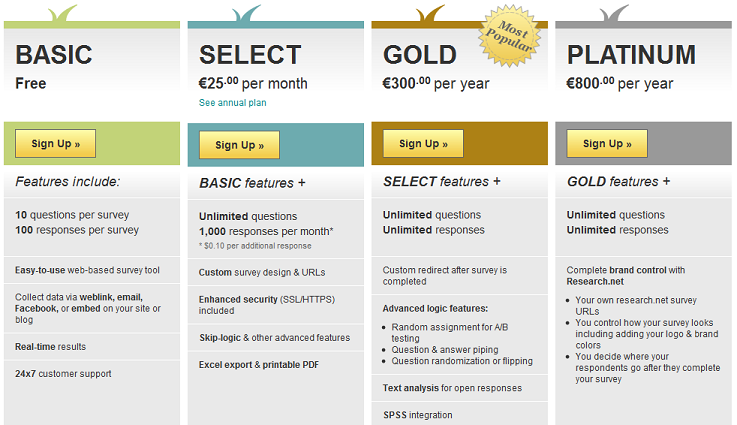 Survey Monkey now offers 4 plans: the already existing BASIC (free) and SELECT (now slightly more expensive €25 per month compared to the old price of $20 per month) and the new GOLD (€300 per year) and PLATINUM (€800 per year). These are not small features and I am sure, this is just the start of it. SurveyMonkey was already a giant, but right now they will be able to also battle with the premium / enterprise survey tools. They are not entry level anymore. For more details about online surveys and survey software reviews visit http://www.survey-reviews.net. Great analysis! The addition of SPSS sounds great but what does that really entail? After reviewing their site it seems that the data can be exported into a csv. file and then uploaded to your own SPSS software on your personal computer. Advertising that SPSS is available made me think that by purchasing an upgraded package I would be able to use SPSS software (as a component of SurveyMonkey) to analyze my data. Would you clarify which is the case?